Ready to give your home a quick Bathroom Remodel? A quick bathroom remodel was what we needed as we moved into an older house. We lived with our bathroom for almost a year before we could not stand it anymore. With company coming to visit and four kids needing the bathroom, this needed to be a weekend project. This is what we started with. A shiny peach and brown tiled bathroom. Not only in the shower, but the whole bathroom had it, half way up the wall. We hated the bathroom tile patterns, but at this point we do not have the time or the money to do a totally bathroom renovation. That can cost anywhere between $2,000-$15,000 depending on the size of your bathroom. We settled on leaving the ceiling (it was already white), leaving the floor, replacing the toilet and buying a nice white shower curtain to hide the shower. So basically we replaced the toilet, painted the ugly walls and the floor vent. We also decided to replace the light fixture. 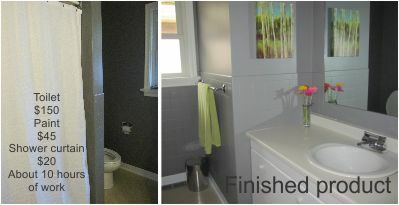 This quick bathroom remodel took a weekend and cost about $300.00 This is how we did it. First we took out the toilet. This is a simple step. 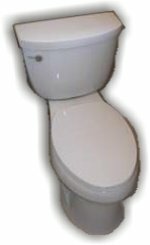 If you are uncertain how to remove a toilet, please visit our toilet page. The reason we removed our toilet was because it was using so much water we wanted to replace it. 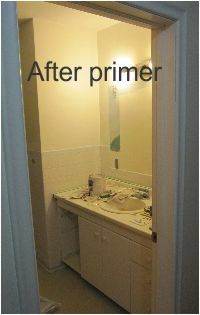 It also makes it so much easier when doing a small bathroom makeover to paint behind the toilet. If you do not want to remove your toilet, you can buy a longer handled roller to reach behind the toilet tank. Once the toilet was out we could start priming the walls. We really did not want to sand all the tiles. What a mess sanding makes. 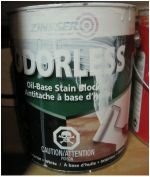 We were able to find an odorless oil-based paint that requires no sanding. I did ask at the paint store and sanding would make the paint adhere better, but eventually when the money is in the bank, we plan on ripping the whole bathroom apart to make it new. Just a tip - because this is an oil-based paint we used a dollar store brush and an old roller. This way we could throw them away once we were done. Next it was time for the fun part - COLOR! 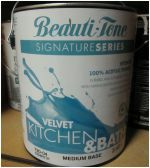 We wanted the paint to last so we went with a kitchen bathroom paint from our local hardware store. This was latex paint and can be quickly cleaned up with water. It was a long weekend full of painting, but the finished product was so exciting. 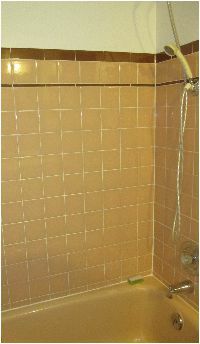 Now we are no longer embarrassed to have our company in our 1950's bathroom. We can all enjoy our quick bathroom remodel, we just have to remember to keep the shower curtain closed as we did not paint the tile in the tub.